In case you haven’t noticed, many people in leadership positions are using increasingly incendiary language for political purposes and gain. If that sounds insane to you, it’s because that’s exactly what it is. It’s just completely off-the-chain bonkers, whacko nonsense. 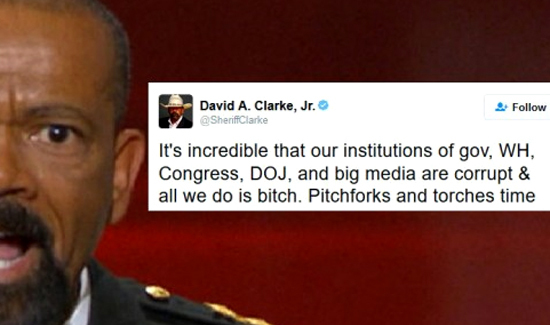 Or take conservative rock star and media personality Milwaukee County Sheriff David Clarke. According to Talking Points Memo: Milwaukee County Sheriff David Clarke “meant it” when he shared a photo of an angry mob on Twitter with a caption reading “pitchforks and torches time,” after he called for violence if his team (Trump) doesn’t win the big prize. Needless to say, serious public safety professionals are already concerned about violence, whether it be arson, assault or murder, after the country decides its future on November 8. Clarke’s no dummy. He’ll say he was speaking metaphorically. The idea that his fans appreciate that distinction is quite frankly ridiculous. Can this crap get any weirder? You just lost my subscription! Sheriff Clarke wasn’t threatening, you tool. Only pointing out what red blooded Americans WILL DO if Hellary steals this election. I’ll be up front. Get real and retract this nonesense! I don’t condone violence. But it is apparent that our president has divided the country and has been the front runner in leading the racial division of police and minority communities. From Camden, to Sanford, to Ferguson he has failed to look at the facts before he acts, and has put his foot in his mouth. This has DIRECTLY caused the death of law enforcement officers. Perhaps peaceful protests and vocal representations that we are not happy with the divider in chief is called for. Otherwise we die. The minority community has the passion, but no facts to support their position. White officers use deadly force on more whites. Allowing for minority community violence, and in looking at facts that show police shootings are down, all show that their passion is without substance. South Carolina was a murder and that officer has been indicted. The rest that I have seen, including Baton Rouge, are more than likely very justified. Tulsa was contageous or sympathetic fire, which was a training failure. Even black officers are being persecuted for exercising proper use of deadly force. A Chicago female officer purposely allowed herself to be beaten instead of using force to stop the violent assault on her. She did not want to put her family through the media hype that you are promulgating.